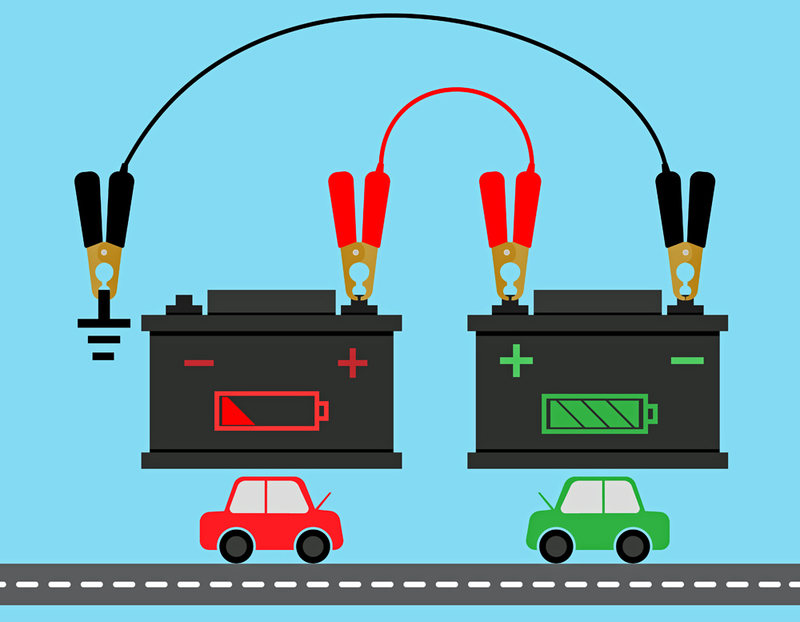 If you're stuck with a dead battery, you can start the car by using jumper cables to connect the bad battery to a fully charged one, whether or not it’s fitted to another vehicle. Here’s a guide on how to jump start a car, assuming that the charged battery is fitted to another vehicle. The cable connections for jump starting often allow only limited current flow, and the less expensive, smaller gauge cables are even more limited thant the better ones. Depending on how dead the battery is, jumper connections may or may not start a vehicle immediately, and may require a few minutes of being hooked to a running car with a fully charged battery to charge it somewhat. Be especially wary when jump starting modern cars with engine management systems – careless jump starting, particularly if the cables are allowed to spark, can cause damage to the car’s computer components. It’s also a good idea to read your car’s manual carefully to see if there are any special recommendations to be observed when jump starting. Some cars with remote mounted batteries, such as many BMWs, are fitted with special terminals under the hood to allow jump starting, and on these cars the jumper cables should only be connected to the special terminals provided. If in doubt, call AA or a local roadside assistance, as they will have the equipment to get your car running without any risk of damage. Position the vehicles close enough so that the jumper cables will reach easily, but, MAKE SURE THE VEHICLES DON’T TOUCH EACH OTHER! Make sure the cables are not in the way of the fan, drive belts or any other moving parts when the vehicles are started. Make sure the booster battery is the same voltage as the dead one in the vehicle - Nearly all modern car and truck batteries are 12 volts. Make sure the ignition switch is in the off position, and the transmission is in Neutral (manual) with the parking brake set, or Park (Automatic). Turn off the lights and other electrical loads on the car with the dead battery, though if it is a modern car with a computer, it’s a good idea to turn on the heater blower motor which will minimize the damage an excessive electrical surge can cause. It’s a good idea to wear safety goggles, as there is always a chance of an explosion and batteries are full of acid. What order do you put jumper cables on? Connect the red jumper cable to the positive terminal of the dead battery (or jump start terminal on a car with a remote mounted battery). Connect the opposite end to the positive terminal of the booster battery or jump start terminal. Connect the black jumper cable to the negative terminal of the booster battery or jump start terminal. Connect the other end of the black cable to a well grounded bolt or bracket on the engine block of the vehicle being jumped, not the battery itself. This prevents sparks near the battery which may cause an explosion. Start the engine of the vehicle with the good battery and let it run at a moderate speed to charge both batteries. Reduce the engine speed to idle on both vehicles and leave all switches off to prevent damage to the vehicle electrical system. Remove the jumper cables in the reverse order they were attached, making sure to never touch the red and black terminals to each other. If the charging system and the battery of the car which had to be jumped is in good condition, 30 minutes of driving should being it back up to a full charge. Remember, sometime in extreme cold conditions a perfectly functional car may need a boost to get started because batteries put out less energy the lower the temperature, while at the same time need more power to turn in the cold.